Update: Mar 1, 2017 – New Board (DD02A). Almost the same as the old board. Changes: Elimination of 39K resistor values. These “same” resistors are now either 33K or 47K. Locations for 1uf, 250V capacitors (C1, C4, & C5) can now fit 6.3mm diameter parts. Original kit shipped with 5mm diameter parts, which are no longer made. Now you can build your own Dekatron Do-Hickie ! 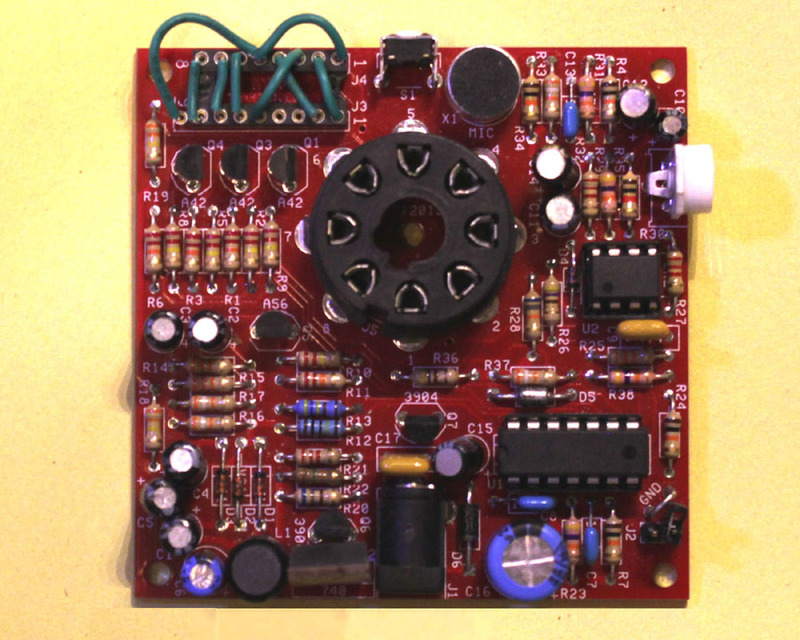 This kit will light up, and control any octal base dekatron, from an AVR microcontroller (uC). It has 4 selectable patterns, including one that responds to audio from a built in microphone. Its also powered from 12VDC or 9VAC. It has an on board HV power supply that boosts the voltage to 480V, needed by the dekatron. A warning on high speed dekatrons: I noticed that many people like choose the high speed tubes. One is the preference to blue. This is a bias, that goes to the LED days. Blue was once a color that couldn’t be made with LEDs. But once they could, people got crazy, and used them all over the place. But also the OG-3, a blue (purple) dekatron, is probably the cheapest dekatron on the market. And for good reason. That purple glow is of a gas that will eventually leave that tube’s internal atmosphere. Either by reacting with the internal metal parts, or by diffusing thru the glass envelope. Hence, no glow, even by just sitting on the shelf, unpowered. They also need 3 times the current, than the standard speed neon orange tubes. They are overall losers, which I would avoid ! The circuit is centered round a small 14-pin Atmel Tiny24 AVR uC. The uC controls the dekatron by explicitly pulsing 3-guide signals (G1, G2, & G3). Yes, 3 guide signals. Most common dekatrons only have two, but a few, ironically called “single pulse dekatrons”, actually have three. There is a jumper on this board, which allows you to select if two, or three guide signals are to be used. If this jumper is left open, then only G1 & G2 are pulsed. If “shorted”, then all three are pulsed, in the appropriate sequence. The uC also monitors the NDX (index) input. This input goes high when the glow is at the “K0” position. That’s how the uC knows where the dekatron glows is. The uC also pulses a power FET, to generate the 480V high voltage needed to fire the dekatron. It monitors, this voltage, thru a resistor divider, to the uC’s voltage comparator input, which compares it to the internal 1.1V reference. Depending if its over or under this reference, the uC will halt, or continue, to issue pulses, respectively. On this board, there is also, a cheapo LM358 dual op-amp. Half of this chip, is used to amplify the output of an electret microphone. That output’s amplitude envelope, is then fed into an ADC input of the uC. That amplitude is used to set the excursion distance of the dekatron, if its in the mode where it mimics an old magic eye. The second half of the LM358 is used as part of the 5V regulator, which uses a cheap 2N3904 (or just about any TO-92 NPN), to make the 5V needed to power the uC. Some kits may also come with a 2mm (or 5/64″) allen wrench. This is needed to adjust the kits that come with trimpots (R30) with a hex slot. If you find transistors that don’t match up with the BOM, please check them with the acceptable substitute guide, by clicking here. Note: J3 to J4 must be wired by you, according to the dekatron you intend to use, before this circuit will work. It does NOT come pre-wired ! The Microcontroller, that comes in the kit, is pre-programmed. No programming required on the your part. If there is any conflict or confusion, PLEASE contact me thru eBay, before preceding ! Taking voltage measurements: There are two pads near one corner, that I label GND. I put a small wire loop into them, but that’s optional. They are both connected to the same signal, which is the system COMMON. Also referred to as GROUND (or abbreviated GND), from the old radio days. When taking a voltage measurement, they should all be REFERENCED to GND. That means the black (negative) lead of your meter should be connected to one, or both, of these pads. The positive (red) lead can then probe around to point you wish to measure. 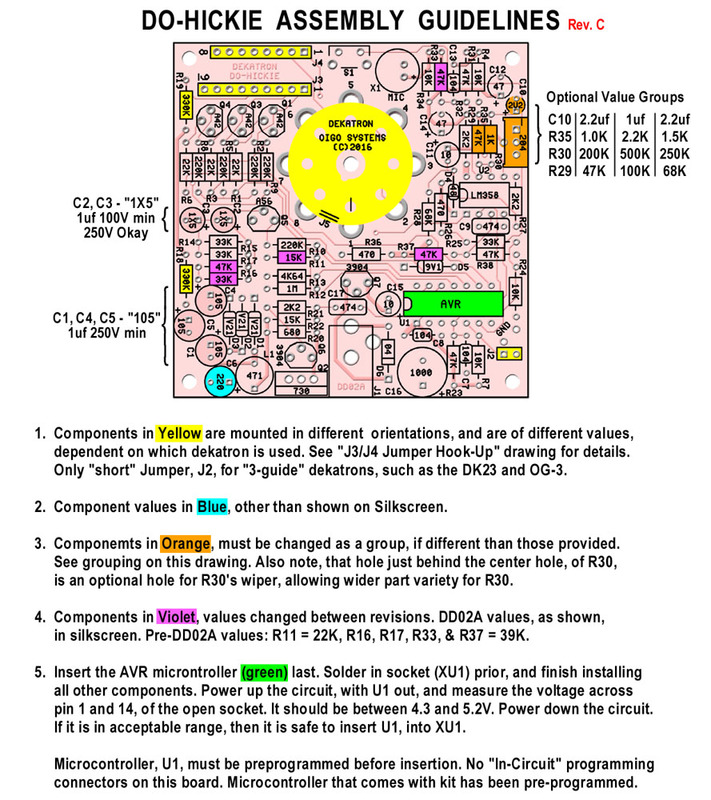 Using a digital volt meter (DVM, or DMM), with power plugged in. Firstly, ALWAYS connect, and KEEP connected, your black lead to GND. Take these two measurements, with the RED lead: D6-K, which is the lead of D6 closest to the edge of the board. It should measure between 9 and 18V DC for the unit to work. Next measure R18’s lead closest to the corner. It should measure 450 VDC nominally. 420V to 480V is okay, too. You can also improvise. First setup in an area with NO carpet, or rugs. Have access to earth ground. A metal water pipe is best, but a nearby appliance that has a metal body, which is plugged into the wall with a 3-prong (grounded) outlet is also good. 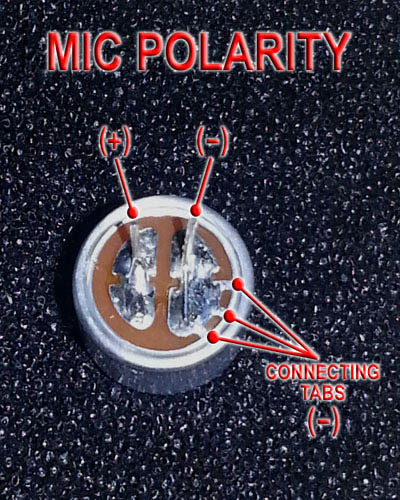 That third grounded prong connects the metal body to ground. Any time you get up, or get back into your workstation chair, grab the metal of that grounded appliance. Keep the parts in the static protected bag and “rails”, and only remove them while your touching that grounded appliance. An anti-static wriststrap and workpad are strongly encouraged.